The populations over which Charles Martel and King Pepin ruled were at very different levels of civilization in different districts. To the west and south the bulk of the people consisted of Latinized and Christian Kelts; in the central regions these rulers had to deal with such more or less Christianized Germans as the Franks and Burgundians and Alemanni; to the north-east were still pagan Frisians and Saxons; to the cast were the Bavarians, recently Christianized through the activities of St. Boniface; and to the east of them again pagan Slavs and Avars. The «Paganism» of the Germans and Slavs was very similar to the primitive religion of the Greeks; it was a manly religion in which temple, priest, and sacrifices played a small part, and its gods were like men, a kind of «school prefects» of more powerful beings who interfered impulsively and irregularly in human affairs. The Germans had a Jupiter in Odin, a Mars in Thor, a, Venus in Freya, and so on. Throughout the seventh and eighth centuries a steady process of conversion to Christianity went on amidst these German and Slavonic tribes. It will be interesting to English-speaking readers to note that the most zealous and successful missionaries among the Saxons and Frisians came from England. Christianity was twice planted in the British Isles. It was already there while Britain was a part of the Roman Empire; a martyr, St. Alban, gave his name to the town of St. Albans, and nearly every visitor to Canterbury has also visited little old St. Martin’s church, which was used during the Roman times. From Britain, as we have already said, Christianity spread beyond the imperial boundaries into Ireland-the chief missionary was St. Patrick and there was a vigorous monastic movement with which are connected the names of St. Columba and the religious settlements of Iona. Then in the fifth and sixth centuries came the fierce and pagan English, and they cut off the early Church of Ireland from the main body of Christianity. In the seventh century Christian missionaries were converting the English, both in the north from Ireland and in the south from Rome. The Rome mission was sent by Pope Gregory the Great just at the close of the sixth century. The story goes that he saw English boys for sale in the Roman slave market, though it is a little difficult to understand how they got there. They were very fair and good-looking. In answer to his inquiries, he was told that they were Angles. «Not Angles, but Angels», said be, «had they but the gospel». The mission worked through the seventh century. 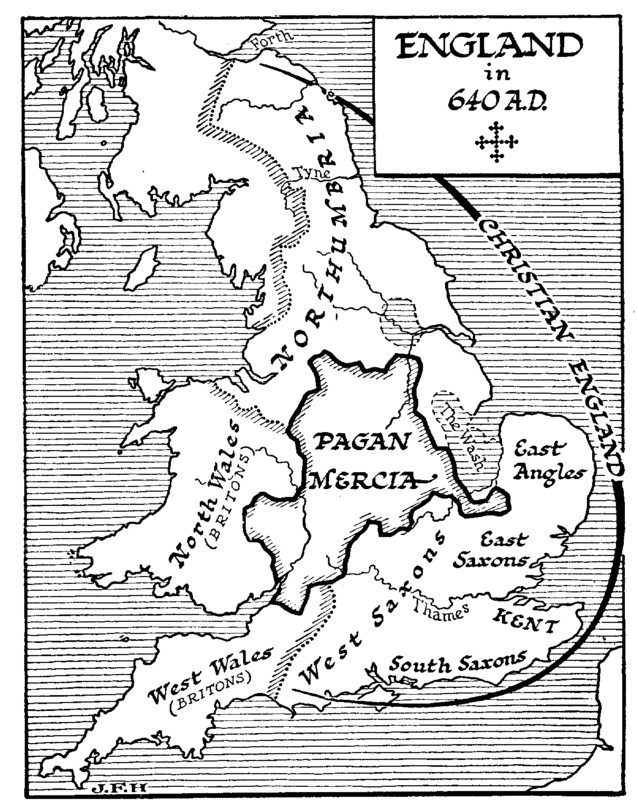 Before that century was over, most of the English were Christians; though Mercia, the central English kingdom, held out stoutly against the priests and for the ancient faith and ways. And there was a swift progress in learning upon the part of these new converts. The monasteries of the kingdom of Northumbria in the north of England became a centre of light and learning. Theodore of Tarsus was one of the earliest archbishops of Canterbury (669-690). «While Greek was utterly unknown in the west of Europe, it was mastered by some of the pupils of Theodore. The monasteries contained many monks who were excellent scholars. Most famous of all was Bede, known as the Venerable Bede (673-735), a monk of Jarrow (on Tyne). He had for his pupils the six hundred monks of that monastery, besides the many strangers, who came to hear him. He gradually mastered all the learning of his day, and left at his death forty-five volumes of his writings, the most important of which are ‘The Ecclesiastical History of the English’ and his translation of the Gospel of John into English. His writings were widely known and used throughout Europe. He reckoned all dates from the birth of Christ, and through his works the use of Christian chronology became common in Europe. Owing to the large number of monasteries and monks in Northumbria, that part of England was for a time far in advance of the south in civilization». Figure 615: Map — England, 640 A.D. In the seventh and eighth centuries we find the English missionaries active upon the eastern frontiers of the Frankish kingdom. Chief among these was St. Boniface (680-755), who was born at Credit-on, in Devonshire, who converted the Frisians, Thuringians, and Hessians, and who was martyred in Holland. Both in England and on the Continent the ascendant rulers seized upon Christianity as a unifying force to cement their conquests. Christianity became a banner for aggressive chiefs as it did in Uganda in Africa in the bloody days before that country was annexed to the British Empire. After Pepin, who died in 768, came two sons, Charles and another, who divided his kingdom; but the brother of Charles died in 771, and Charles then became sole king (771-814) of the growing realm of the Franks. This Charles is known in history as Charles the Great, or Charlemagne. As in the case of Alexander the Great and Julius Cæsar, posterity has enormously exaggerated his memory. He made his wars of aggression definitely religious wars. All the world of north-western Europe, which is now Great Britain, France, Germany, Denmark, and Norway and Sweden, was in the ninth century an arena of bitter conflict between the old faith and the new. Whole nations were converted to Christianity by the sword just as Islam in Arabia, Central Asia, and Africa had converted whole nations a century or so before. With fire and sword Charlemagne preached the Gospel of the Cross to the Saxons, Bohemians, and as far as the Danube into what is now Hungary; be carried the same teaching down the Adriatic Coast through what is now Dalmatia, and drove the Moslems back from the Pyrenees as far as Barcelona. Moreover, he, it was who sheltered Egbert, an exile from Wessex, in England, and assisted him presently to establish himself as King in Wessex (802). Egbert subdued the Britons in Cornwall, as Charlemagne conquered the Britons of Brittany, and by a series of wars, which he continued after the death of his Frankish patron, made himself at last the first King of all England (828). But the attacks of Charlemagne upon the last strongholds of paganism provoked a vigorous reaction on the part of the unconverted. The Christianized English had retained very little of the seamanship that had brought them from the mainland, and the Franks had not yet become seamen. As the Christian propaganda of Charlemagne swept towards the shores of the North and Baltic Seas, the pagans were driven to the sea. They retaliated for the Christian persecutions with plundering raids and expeditions against the northern coasts of France and against Christian England. These pagan Saxons and English of the mainland and their kindred from Denmark and Norway are the Danes and Northmen of our national histories. They were also called Vikings, which means «inlet-men», because they came from the deep inlets of the Scandinavian coast. They came in long black galleys, making little use of sails. Most of our information about these wars and invasions of the Pagan Vikings is derived from Christian sources, and so we have abundant information of the massacres and atrocities of their raids and very little about the cruelties inflicted upon their pagan brethren, the Saxons, at the hands of Charlemagne, Their animus against the cross and against monks and nuns was extreme. They delighted in the burning of monasteries and nunneries and the slaughter of their inmates. Throughout the period between the fifth and the ninth centuries these Vikings or Northmen were learning seamanship, becoming bolder, and ranging further. They braved the northern seas until the icy shores of Greenland were a familiar haunt, and by the ninth century they had settlements (of which Europe in general knew nothing) in America. In the tenth and eleventh centuries many of their sagas began to be written down in Iceland. They saw the world in terms of valiant adventure. They assailed the walrus, the bear, and the whale. In their imaginations, a great and rich city to the south, a sort of confusion of Rome and Byzantium, loomed large. They called it «Miklagard» (Michael’s court) or Micklegarth. The magnetism of Micklegarth was to draw the descendants of these Northmen down into the Mediterranean by two routes, by the west and also across Russia from the Baltic, as we shall tell later. By the Russian route went also the kindred Swedes. So long as Charlemagne and Egbert lived, the Vikings were no more than raiders; but as the ninth century wore on, these raids developed into organized invasions. In several districts of England the bold of Christianity was by no means firm as yet. In Mercia in particular the pagan Northmen found sympathy and help. 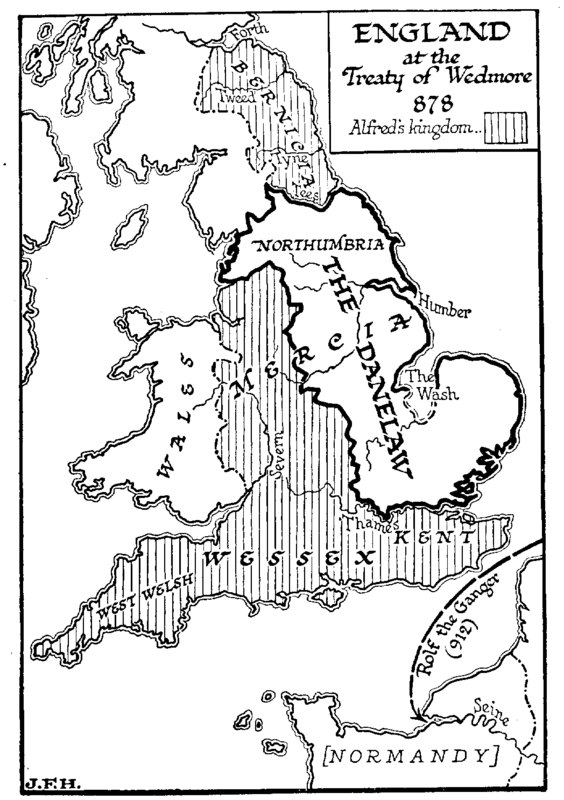 By 886 the Danes had conquered a fair part of England, and the English king, Alfred the Great, had recognized their rule over their conquests, the Dane-law, in the pact he made with Guthrum their leader. A little later, in 912, another expedition under Rolf the Ganger established itself upon the coast of France in the region that was known henceforth as Normandy (= Nortbman-dy). But of how there was presently a fresh conquest of England by the Danes, and bow finally the Duke of Normandy became King of England, we cannot tell at any length. There were very small racial and social differences between Angle, Saxon, Jute, Dane, or Norman; and though these changes loom large in the imaginations of the English, they are seen to be very slight rufflings, indeed of the stream of history when we measure them by the standards of a greater world. The issue between Christianity and paganism vanished presently from the struggle. By the Treaty of Wedmore the Danes agreed to be baptized if they were assured of their conquests; and the descendants of Ralf in Normandy were not merely Christianized, but they learnt to speak French from the more civilized people about them, forgetting their own Norse tongue. Of much greater significance in the history of mankind are the relations of Charlemagne with his neigbours to the south and east and to the imperial tradition. A General History of Europe , Thatcher and Schwill. N.B. — Vik-ings, not Vi-kings, Vik = a fiord or inlet.